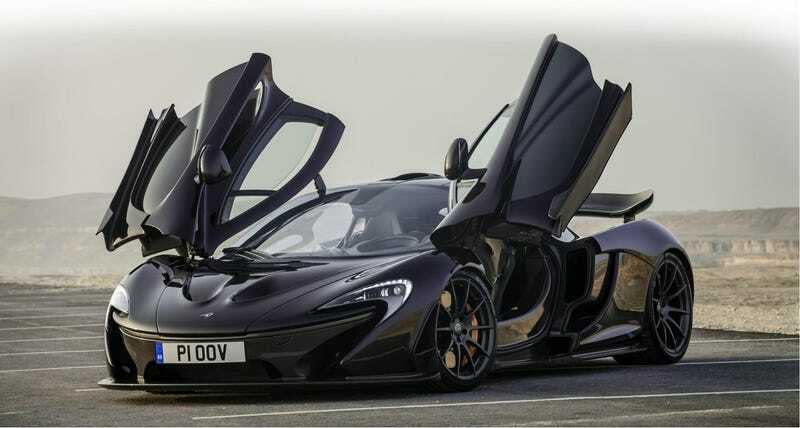 The McLaren P1, crown jewel of the company’s sports car lineup, is often compared to its hybrid supercar rivals like the Porsche 918 or the Ferrari LaFerrari. You would think McLaren would claim it is comparable to none, and yet the company’s website lists the P1's specifications directly compared to the McLaren F1 and... your “average hatchback”? As the owner of what McLaren likely determines to be an “average hatchback,” I think they’re going for a humbling comparison approach. They’re breaking the P1's ridiculous performance down into comparison figures that I can comprehend. According to the chart, the average hatchback reaches 60 from zero in 9.5 seconds, compared to the F1's time of 3.2 seconds and the P1's time of 2.8 seconds. I get it now! That’s fast, and I can understand how fast because it gets to a speed I’ve often traveled in a third of the time it took me in my average hatchback! The odd comparison lets McLaren brag to us peasants about how the P1 can cover a quarter mile in almost the same amount of time it takes a hatchback to even hit 60 MPH, or how the P1 is edging on 200 MPH before the hatchback has even hit the quarter mile. It’s McLaren’s way of ruining the confidence and ignorance of us normal folk, furthering the myth of the inevitably iconic P1. Or it’s just a benchmark. And to be honest I don’t really care. I wanted the Porsche 918 anyway.